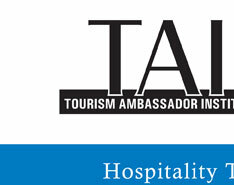 The Tourism Ambassador Institute® (TAI) is the accrediting body for the Certified Tourism Ambassador™ (CTA) Program. In this capacity, the TAI accredits organizations in regard to their program of study for front-line hospitality employees and volunteers leading to CTA certification. The accreditation process ensures that Accredited Providers conform to quality assurance standards and helps TAI to maintain a uniform standard of quality for the CTA designation nationwide. The TAI grants Accredited Providers the licensing right to present, on behalf of the TAI, the CTA designation to those individuals who satisfactorily complete all program requirements. As a result of the high standards maintained within the CTA Accreditation process, the program holds a prestigious position within the convention & tourism industry and, as such, is more meaningful in the eyes of civic leaders, employers and, most importantly, front-line employees and volunteers who seek the certification. Curriculum – A review of the curriculum and training materials that clearly indicates the Accredited Provider’s efforts to revise and update the curriculum to reflect changes in the marketplace. Participant Evaluation Process – This refers to participants in classroom training. A review of the Participant evaluation process will indicate appropriate strategy (and tools) used to ascertain Participant acquisition of the CTA learning objectives and the completion of all requirements for the designation (or for recertification). Facilitators – An ongoing evaluation of facilitators is conducted to ensure that they are teaching the copyrighted curriculum as developed and that their facilitation delivery creates interest in and enthusiasm for achieving and maintaining the CTA designation. Marketing & Communications Assessment – A review of marketing and communications materials will show conformance to the TAI and CTA trademarked symbols, as well as consistent messaging about the CTA as a designation on a national perspective. Administrative Assessment – A review of administrative processes will show compliance with the CTA program administration standards (e.g., application process; database management; networking events/opportunities; training sessions; collateral materials; web site resources; communications; re-certification process; and other administrative functions as outlined by the TAI). The TAI will review the “CTA Accredited Provider Self-Study” questionnaire and accompanying documentation to determine if the Accredited Provider is in compliance with agreed-upon criteria. TAI representatives may also request additional information from the Accredited Provider, and may, on occasion, complete a site visit to meet with key stakeholders in the Accredited Provider’s city/region. If it is deemed that the requirements have been met, the Accredited Provider will be granted accreditation for another full year. If the requirements have not been met, the Accredited Provider will lose its accreditation status and licensing rights to present the CTA designation on behalf of the TAI or to renew the designation for existing designees. If this were to occur, all CTAs who achieved their designation through this Accredited Provider would forfeit their CTA designation at the end of their annual cycle. A formal appeals process will be used in the event the Accredited Provider chooses to bring their procedures and processes in compliance with the accreditation standards for Accredited Providers. The TAI retains the exclusive right to grant accreditation to interested Accredited Providers. Maintain a low annual accreditation fee to Accredited Providers. Accredited Providers are required to pay an annual fee to maintain their accreditation status. The fee will be established annually by the TAI. Contact the TAI for more details. The CTA Annual Accreditation Fee includes an annual licensing fee authorizing the Accredited Provider to use the trademarked term CTA. In the event the Accredited Provider loses its accreditation, all licensing rights are withdrawn by the TAI. The Accredited Provider will also be responsible for paying a CTA processing fee of $10.00 per CTA. This is per individual CTA, on an annual basis. In the event an Accredited Provider does not conform to the accreditation standards established by the TAI, all program accreditation and licensing rights to the CTA designation will be withdrawn and the organization will cease to use the trademarked CTA (Certified Tourism Ambassador) or TAI (Tourism Ambassador Institute) names in conjunction with their current or future front-line training or ambassador programs. The formal appeals process may be used and reinstatement may be granted by TAI, if significant quality assurance compliance has occurred.